Our new, beautiful Black Shaker cabinets are stunning! Black Shaker is here! Finally, a black shaker style with that sleek, modern look that is so hard to find has arrived. 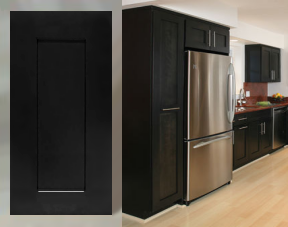 These premium kitchen cabinets are all wood with a beautiful, black finish. The line includes corbels, moldings and end-panels for just the right accents. Click on the picture to learn more!